For those that are struggling with which way is up (it's one of those things that once you know, you never question again), pretend that the diagrams above are plan-view photographs, and the pins are coming out of the screen towards you. You'd connect a cable by pushing it on towards the screen. Pin 1 is often marked on the board/header in some way. The red striped wire on a grey ribbon cable is always pin 1. The 'plugs' on the ends of the ribbon cable are called 'IDC Sockets'. An IDC socket might have the ribbon exiting from either side. The IDC sockets in the pictures don't have locating lugs - They are heath-robinson affairs made by hacksawing apart a hard-drive cable. 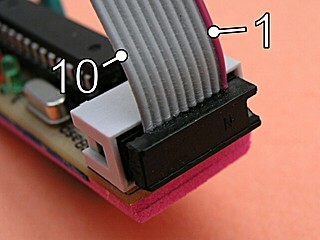 The red striped wire on a grey ribbon cable identifies wire 1. 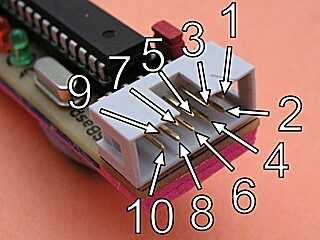 The 'unconnected' pin in the 10 pin header is sometimes used for other things, such as a logic-level serial output for debugging. 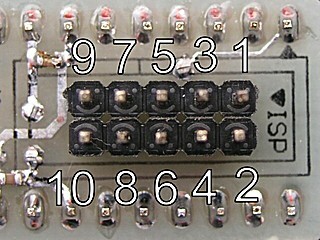 6-pin headers are used on more modern prototyping boards and programmers. 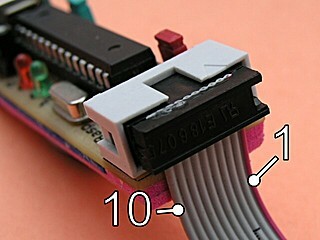 10-pin headers are still widely used, possibly because 10-pin boxed headers and IDC sockets are easier to get hold of. 10-pin ribbon cables might (in theory) be more noise tolerant, as the RESET, SCK and MISO wires are interleaved between ground wires. It's advised to keep programming cables 'short'. Mine are generally around 25cm long. The "extra" ground pins are occasionally used for other purposes. There is no compulsion to use these layouts on your board at all - but if you're making a programmer, you'd be mad not to. 6-pin headers obviously take up less board-space than 10-pin ones (did I really need to add this? ).